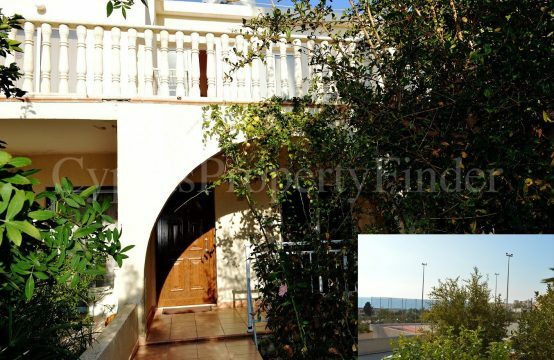 An Extremely Well Presented Two Bedroom One Bathroom Top Floor Apartment with Breath Taking Panoramic Views of Paphos town and the Mediterranean Sea! The Property is located on a Lovely Development in the charming traditional village of Tremithousa just 4km North West of Paphos Town. The development offers a Communal Pool that is surrounded by ample crazy paved patios where you can enjoy Fantastic Unobstructed Sea Views and soak in the Mediterranean sun. On entering the Property, immediately to the right is the neat U-Shaped Light and Bright Kitchen. The Kitchen is well equipped with white wall and base unites and white goods. Beyond the kitchen is the Open Plan Living/Dining Area that is separated by a breakfast bar. This area is also bright and spacious, attractively furnished and neutrally decorated. Sliding patio doors lead out to the Large (12 sq. m.) Private Balcony with awning offering Pool and Simply Stunning Coastline Views. This is a perfect spot to watch the sunsets and catch a cooling breeze. The hallway off the living area leads through to well-appointed Two Double Bedrooms and a Modern Family Bathroom. Both Bedrooms are of a good size and have Fitted Wardrobes. The Main Bedroom benefits from access to the Large Balcony that is shared with the Living Area. The Property has Air Conditioning and Ceiling Fans Throughout and it is being sold Fully Furnished with White Goods. There is also an Allocated Covered Parking Space. The village of Thremithuosa has tavernas and shops, with Paphos Town just a few minutes’ drive. This property is ideally placed for permanent residency or holiday occupation.